"As you drive up to the front door, you'll notice it. There's something in the air. The inviting garden - rather than having been manicured to within an inch of its life - hums with exuberance and life. The driveway is clean, paved, even. The front door - always open - looks just like something you'd add to your "My Dream House" board on Pinterest. If the dogs' warm welcome doesn't bowl you over, the charming hostess' certainly will. And when you get to your room - well, it's so much more than a home-away-from-home. It's the home you'll wish was home. One you'll come back to again and again. And again. Yep, there's something in the air at Anchor's Rest. Maybe it's a commitment to excellence. Maybe it's love, with a healthy dash of passion for what they do." It's sentiments like these that make us love what we do here at Anchor's Rest. We put our hearts and souls into creating the best possible stay - the kind of getaway we'd want to experience ourselves. And it just means the world to us when someone takes the time to tell us that they've noticed. That it shows. This year we've already been awarded four different titles, each recognising our commitment to excellence. The thing about these awards that we really love, is that they give our guests old and new the peace of mind that Anchor's Rest is a great place to stay. 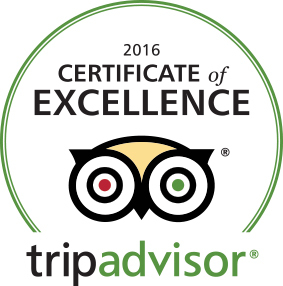 This is the third year that we have received this award from TripAdvisor, and we're very proud to have it again. Founded in 2010, the Certificate of Excellence honours hospitality businesses that deliver consistently great service. This designation is given to establishments that have consistently achieved great traveller reviews on TripAdvisor over the past year. Establishments earning the Certificate of Excellence are located all over the world and have continually delivered superior customer experience. Who is eligible to receive a Certificate of Excellence? Accommodations, eateries, and attractions worldwide are eligible to receive a Certificate of Excellence. We are also listed on the Booking.com website and have received many good reviews from guests who have booked accommodation through Booking.com. Our Booking.com Account Manager recently delivered our plaque (photo attached), which has a 9.5 rating out of 10. She commented that she has never given out a plaque with such a high rating before! 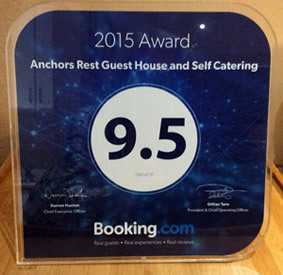 Each accommodation establishment listed with Booking.com receives a plaque on an annual basis with their average score for the year, so we have received this for three or four years now. But this year we achieved our highest score yet, and we're delighted. We look forward to even more of these! HotelsCombined recently announced that we have been awarded their 2016 Recognition of Excellence Award. 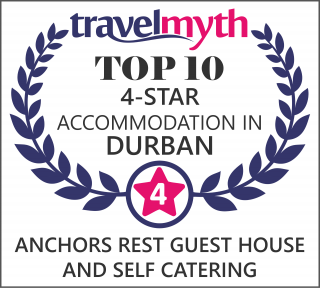 "Before we announce this to the public and media, I wanted first to let you personally know that Anchor's Rest Umhlanga has just been awarded the HotelsCombined Recognition of Excellence for 2016! This award is in recognition for consistently achieving the highest standards of Customer Satisfaction worldwide. We know this because the team here at HotelsCombined undertook the largest analysis of customer opinions online across millions of points of data. We now have a complete and comprehensive understanding of over one million hotels worldwide, taking our team of data experts' months to finalize. Specifically to date, we found and processed 287 opinions that your guests have posted on a variety of different websites, forums and social media, resulting in an incredible score of 9.55 out of a possible 10. Congratulations on your outstanding work!" What we love most about this award is that it is rooted securely in the great feedback we've had from our guests - people like you, who value what we do. These kinds of reviews are the reason we work so hard. When a search algorithm based on user reviews tells you you're doing something right, it must be true! Local is lekker, as they say. 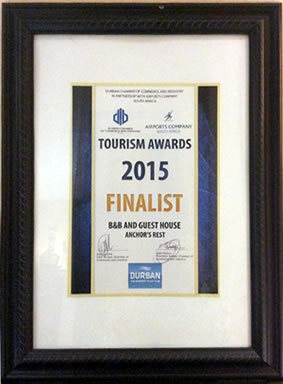 We were awarded a certificate by the Durban Chamber of Commerce and Industry as a Finalist in the 2015 Tourism Awards in the B&B and Guest House Category. We love Durban and it's a privilege to run a business that showcases our beautiful home town. Thank-you, Durban, for this delightful vote of confidence! There you have it: for an excellent stay, whether for business or pleasure, Anchor's Rest is the place to stay in Umhlanga. It's certified! We're looking forward to sharing that excellence with you soon.